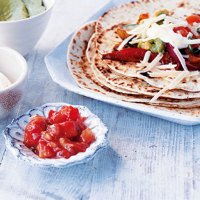 A popular choice for all the family, these assemble-yourself veggie fajitas are quick to make and great fun to eat. Cut the peppers and courgettes into batons and slice the onions. Place in a bowl and mix with the oil, cumin and chipotle paste. Warm a large, heavy-based frying pan over a high heat. Add the vegetables and fry, stirring often, for 10 minutes, until tender and starting to be well coloured at the edges. Add the rocket and seasoning and mix to combine. Add the juice from one of the lime wedges and immediately carry the sizzling pan to the table. Serve with the warm tortillas, the remaining lime wedges, Waitrose Tomato Salsa, guacamole, sour cream, and grated cheddar cheese to spoon over.